March is the month when the basketball gods take the month off from the NBA to check out how the next generation of association stars are doing in the NCAAs, and with as many as four first-round picks in this upcoming draft on the table for the Boston Celtics, it's probably not a bad idea for us to do the same. If the season ended today, Boston would have the 14th (via the Sacramento Kings), 21st (via the Los Angeles Clippers), and 22nd (their own) picks of the 2019 NBA Draft, and could end up with the ninth or tenth pick for good measure should the Memphis Grizzlies find enough wins in the remainder of their schedule to deliver their pick to the Celtics. That pick, protected 1-8 this season, and 1-6 the next before becoming unprotected the year after, could become one of the most valuable assets in the league if not conveyed over the next two seasons, as the end of the Grit-n-Grind era portends a long postseason drought at the same time a "double draft" may occur, with 19-year-old players joining recent highschool graduates in draft eligibility should the league eliminate the one-and-done rules currently keeping them out by that time. So, with that strong motivation behind them, it's not out of the question Boston could pick in all four of those ranges, or even move up to somewhere between the fourth to sixth pick by packaging them to a team in need of multiple shots at finding quality young players, like the Washington Wizards, or Atlanta Hawks. To that end, let's take a quick look who might be on the table for the 5-8 range (if Boston gets and uses all four of their picks to move up), the 9-10 range (if the Cs get the Griz pick), the 13th-14th range (for the Kings' pick), and the 18th-24th range (for Boston and the Clippers picks, depending on how their respective seasons shake out). We'll also take a very brief look at the absolute best-case scenario, just for fun. With Boston already stacked to the point of it possibly being a problem, the Celts are in the position of being able to take very big swings with at least one or two of the picks if not all of however many they receive, so expect that tactic to be particularly present in the logic used by Danny Ainge and the front office. Positionally, a ballhandler and a mobile-but-strong big able to shoot are the more plausible areas Boston would be able to carve out some time for a success, so that may be a factor, too. 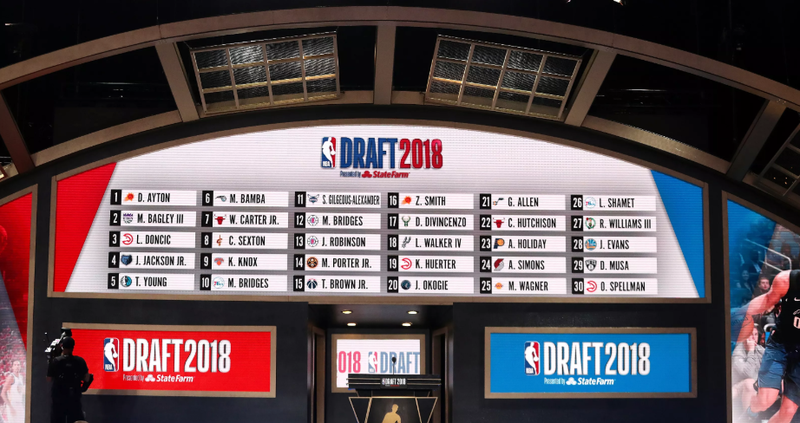 The Kings pick is almost certainly going to be Boston's best shot at landing a future star this season, in that is almost certainly conveying, barring the disaster of them landing the top overall pick, which would then be handed to the Philadelphia 76ers in exchange for their own, currently projected around the 26th overall. There's a very small chance Boston moves up in the lottery through the kind of luck that brought the Cleveland Cavaliers a top pick in 2014, though, as noted above, it's not the top pick the Cs want, but the second, so they can keep and use it themselves. The odds are nearly the same -- as in, very unlikely -- but the Cs could see themselves land as high as that second pick, which, at least right now, would almost certainly be used on Ja Morant of Murray State. We won't go too crazy about this option right now, but expect him and the combined pick range broken down in greater detail as part of our NBA Draft prep coverage next week, moving towards the more likely picks and scenarios as the draft approaches. Who would you most like to see of the above (or unmentioned)? Who do you want to avoid like the plague? Let us know in the comments below.